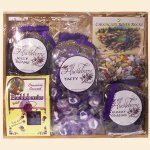 This candy lovers delight includes: Wild Huckleberry Gummy Grizzlies, Jelly Beans and Taffy, Chocolate Covered Huckleberries & Chocolate River Rocks. Hand crafted custom gift crate makes a perfect gift for any occasion. A fun way to taste the Wilderness.